The weather map for April 3 shows plenty of winter weather in the northern US. Definitely nbot baseball weather. Image courtesy of NOAA. With April Fools’ Day having passed, we are now definitely into spring, though in some places you wouldn’t know it. And there was a lot of newsworthy weather in the last month. Let’s Go Around The World. On March 14, 2018, Boston, Massachusetts, USA recorded its greatest one-day snowfall total ever in the month of March. Strangely, at 14.5 inches, it was not the greatest total for so late in the season; that record is 22.4 inches, set on April Fools’ Day, 1997. The weather has a sense of humor. Normally the snow season near the Great Lakes goes like this: The first cold blasts of fall pick up moisture from the warm lakes and dumps it on nearby shores. By mid-winter,, the lakes are largely frozen, so the lake effect is shut down. As the ice melts the weather becomes too warm for snow. Not this year. The unusually warm February melted the frozen lakes and then a March cold blast produced heavy snows wherever the wind was onshore. 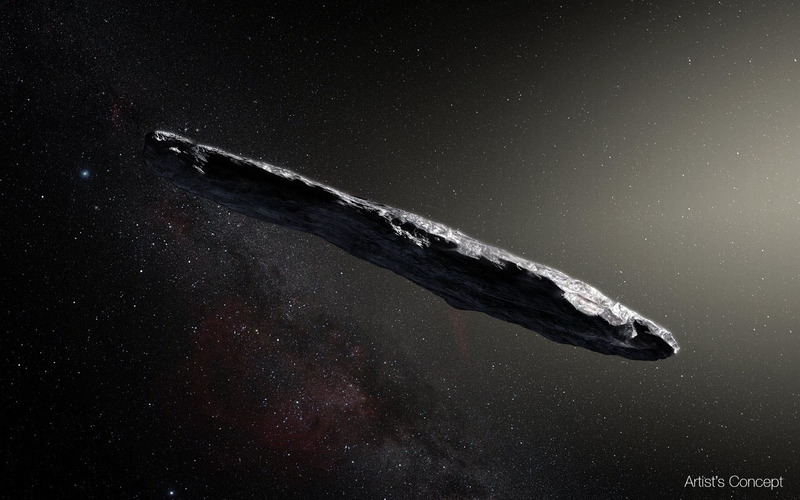 Oumuamua is the first object scientists have identified as coming from another star system. Artist’s rendering courtesy of NASA. No, it’s not an alien spaceship or Little Green Monster. Oumuamua is the first piece of space junk that scientists have confirmed came from outside the solar system. This rock was probably ejected during planetary formation from a nearby binary star system. No doubt when our own planetary system formed, rocks like Oumuamua were ejected into the intergalactic void. Possibly residents in some far off galaxy will identify one as a visitor from Sol. What Does The Weather Cost? Ooops, typo. Sorry to disappoint you. You cannot buy the weather. But you can buy the Weather CHANNEL. It was sold for 300 million dollars in March, about a tenth of what the seller paid for it. A casual visitor to parts of Siberia recently might have believed a pack of territorial dogs had passed through. The yellow snow, however, was a result of Saharan dust making its way northward and meeting a Siberian cold front. The phenomenon occurs every five years or so and taints the falling snow a yellowish-orange. Saharan dust spreads rather widely, and meteorologists pay careful attention to it during the Atlantic hurricane season; when dry, dust-laden Saharan air intrudes into the tropics, it inhibits tropical storm development. Floods, wind, fire. We can handle those. But now the weather has gone too far, causing the postponement of the first games of the 2018 baseball season in Cincinnati and Detroit, which had been scheduled for March 29. The system that brought the heaviest rain to southeast Texas since Hurricane Harvey pushed torrential downpours north and east. Editorial comment: In the opinion of this writer, the fault lies not with the weather but with the schedule of Major League Baseball. All games before the end of April should be played in southern cities or domed stadiums. The average high temperature in Cincinnati on March 29 is 59° and in Detroit it’s 50°; at night, it can get down to freezing. Too cold for good baseball. The atmosphere protects us from incoming stuff of all sizes. Everyone knows how the ozone layer absorbs harmful ultraviolet light. But the atmosphere also stops larger objects — like the defunct Chinese space lab, Tiangong-1, which crashed in the Pacific ocean on April 1, 2018; 90% of it burned up. Larger objects, such as the asteroid that struck near Yucatan, Mexico and is alleged to have caused a mass extinction (including that of the dinosaurs) are too big to be effectively blocked. Rising ari at the equator and sinking air near 30 degrees creates a Hadley Cell. Graphic courtesy of NASA. Garbage is piling up in several major oceans. But why does it seem to find a home in the center of the North Pacific or South Indian Ocean rather than spreading all over the place? But something strange happens because the earth spins. At a certain rate of spin, the circulation changes into something much more complicated. Air still rises at the equator and sinks at the poles; but in between, three cells develop: air sinks around 30 degrees latitude and rises at 60 degrees. A complicated jet stream pattern appears in mid-latitudes. Theoretical meteorologists cannot account for this circulation because they cannot solve the six equations in six variables that govern the system. But looking at parts of the system, we can come to some conclusions. First of all, the sinking air at around 30 degrees implies fair weather — and in fact most of the world’s deserts are located in this zone. On either side of the desert zone are easterly winds near the equator and westerlies in mid-latitudes. When these winds are superimposed on a large ocean, it is not hard to see that a closed gyre will form, in the center of which is a calm area where trash can accumulate and not escape. The North Atlantic, North Pacific, and South Indian Oceans all have such gyres. Of more practical and immediate interest is the easterly flow between the equator and the desert zone, in which tropical cyclones form. After last year’s active (perhaps an understatement) Atlantic hurricane season, climatologists are watching to see if there has been some fundamental change in ocean-air dynamics, or if 2017 was a one-off. The next Weather Around The World will be published on May 1, 2018. The next Climate Change Checkup will be published in mid-April after NOAA’s release of March global temperature data. LOL!!! If I did have the money, I’d buy the Weather Channel and give it to you, Jon! Any idea why the weather channel is selling cheap? I like watching the weather channel. Just curious. I dunno. Decoded should buy it Vicky has the money.